The Super Mario manga by Kazuki Motoyama, also known as KC Mario, was serialized by Kodansha in their manga anthology Comic BomBom from December 1988 through September 1998, with side-chapters published in sister publication Deluxe BomBom, spanning a total of 183 stories. The manga features original characters, some meta jokes, and occasional references to Japanese pop culture. The manga was never published under a single consistent title, instead changing its title to tie-in with the latest Mario-related game being adapted at the time, starting from Super Mario Bros. 3 all the way up to Super Mario 64 (with the final two collected volumes in this sub-series tying into Yoshi's Story). The manga ceased publication due to Kodansha losing the Mario license and has never been reprinted since then. A total of 43 collected volumes or tankōbon were published of this series. 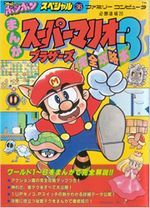 The first volume, based on Super Mario Bros. 3, was published as a manga strategy guide as part of Kodansha's Family Computer Hisshō Dōjō series under the "Comic BomBom Special" imprint. From Super Mario Land and onward, the volumes were published as regular manga collections under the "KC Deluxe" imprint. The first few pages of each volume contain a mini strategy guide featuring commentary on levels from the games the stories are based on. While the volumes contain most of the mainline chapters and side-chapters, there were however five chapters, including the finale, that were not featured in any of the collections. There were also two collections of four-panel strips released under this series, with the strips themselves being drawn by various artists in addition to Motoyama. 1-1 Goal from Super Mario Land. Bonus Game from Super Mario Land. Mario, Luigi and Peach in the Sky Pop. Mario, Peach and Luigi preparing to eat a Yoshi Egg. Two-page spread of the enemies from Super Mario Land 2: 6 Golden Coins. Two-page spread of the enemies from Wario Land: Super Mario Land 3. Page spread of the enemies from Donkey Kong for Game Boy. A poster of Pauline and Donkey Kong Jr. in the first Volume based on Donkey Kong. A Pillar having fallen on Luigi. Daisy, holding a fan letter. Peach and Daisy fighting about their popularity. Yoshi from the live-action Super Mario Bros. movie. Baby Mario, Baby Luigi, Yoshi, and Poochy in the third Volume of Super Mario: Yoshi's Island . This page was last edited on April 5, 2019, at 23:43.